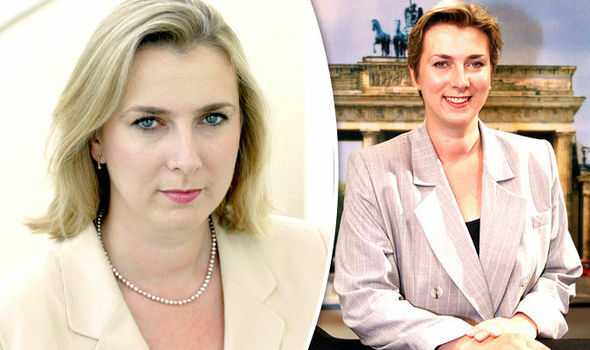 49-year-old says the diagnosis came as a 'relief' after suffering symptoms BBC correspondent Caroline Wyatt says she is 'utterly overwhelmed' by the support she has received since she was diagnosed with multiple sclerosis. It was announced yesterday that the veteran reporter is stepping down as the corporation's religious affairs correspondent due to the impact of the neurological condition. The 49-year-old was diagnosed with MS late last year but has revealed that she has lived with its impact for 25 years and is relieved to be getting treatment. Ms Wyatt, who has reported from around the world during her career, said last night: 'I have been utterly overwhelmed by the support I've had from my colleagues, friends and family in recent days and months, and am so grateful for the support the BBC is giving me while I recover from my current relapse. 'After being diagnosed with MS late last year, I feel very lucky to live in a country where the NHS is able to do much to help people with MS, and where so much research is being done. After telling of her sadness at stepping down from her current role, she added: 'I feel incredibly blessed in having been able to work as a BBC correspondent for the past 23 years. She will be returning to the airwaves on Radio 4 and World Service after a break for the rest of the summer following medical advice, the BBC said yesterday. The respected news reporter has worked in a number of roles since joining the corporation as a trainee in the early 1990s. She has reported on fall of the Berlin Wall and covered wars in Iraq, the Balkans and Afghanistan. More recently she has presented a number of programmes on Radio 4, including The World Tonight, From Our Own Correspondent and the Saturday edition of PM. BBC colleagues showed their support for the popular reporter on Twitter yesterday. Producer Callum May wrote on Twitter: 'Can't pretend I'm not v sad about the news that Caroline Wyatt is to step down as BBC News's religious affairs correspondent.